Christmas is approaching and kids are bursting with excitement and anticipation. Presents! Presents! TOYS! TOYS! TOYS!!! 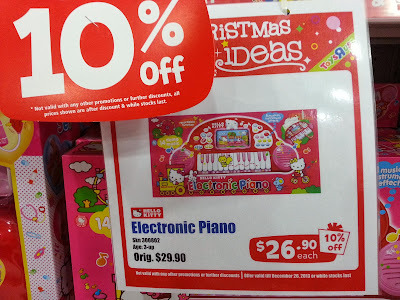 As much as I like imaginary play and educational toys, Kiddo also gets to play with toys of her choice when we go to the toy store. Kiddo has received quite a lot of presents during birthdays and X'mas. Some are fab and some are not. Those that are not so fab are really frustrating to play with and I will show you ladies a few of them coz it is best to avoid them. I'll start off with what kiddies like and post the not so fun ones in another entry. 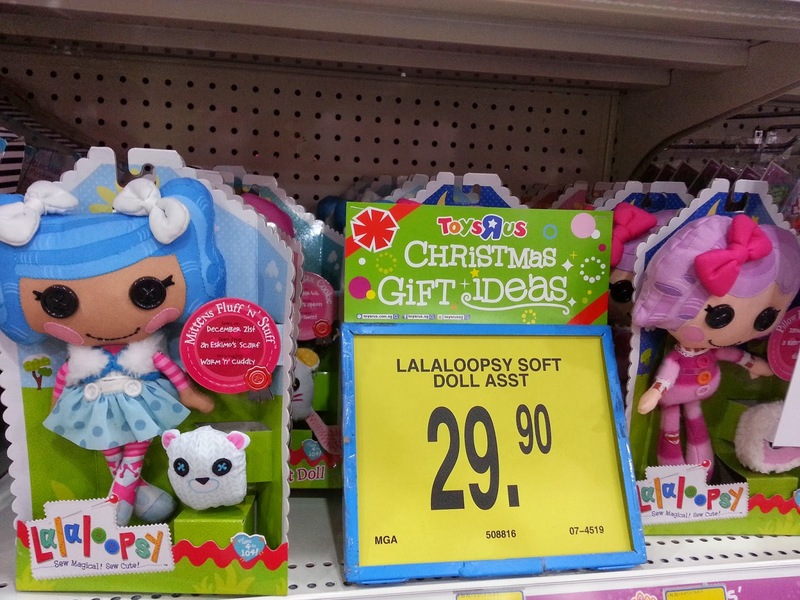 Click here for what to toys to avoid. The toys that I feature are available at Toys R Us. On the very top of Kiddo's long list of presents that she yearns for, is the Barbie Mariposa. One of the girls in Kiddo's ballet class mentioned Mariposa and all the girls' faces lighted up. 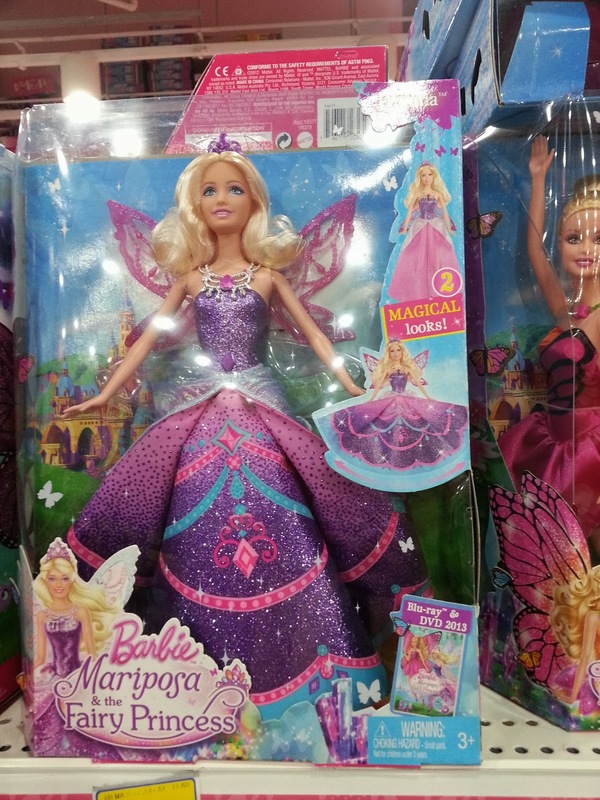 So, I am quite sure this doll will be a hit with most girls of 3- 6 years old. 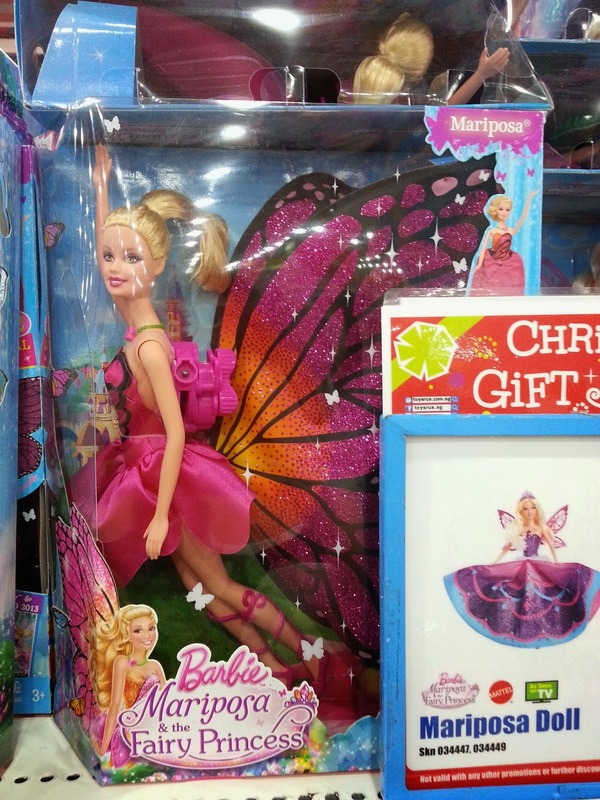 This is Catania the Fairy Princess. Both dolls are at $49ish and their wings/skirt transforms when a button is pressed. The next item that Kiddo wants dearly is the Moxie Girlz Magic Hair Bendy Braids. I saw several lil' girls bending down to admire this upper-half-of-a-person doll while at the store, so I guess this toy shouldn't go wrong. Girls can have fun braiding and colouring the hair as well as adding accessories here and there on the doll. 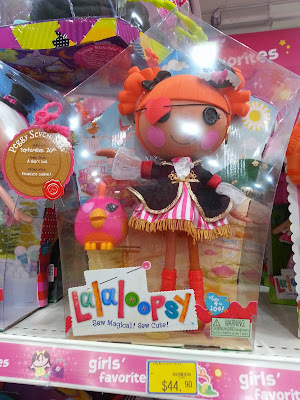 I'm gonna include this range of Lalaloopsy doll sets here for reference. 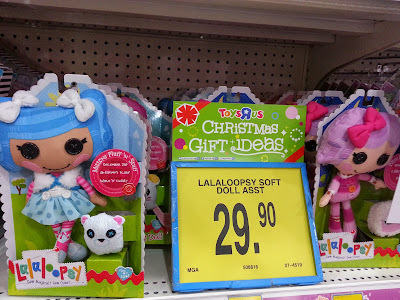 I absolutely love these loopy whimsical rag dolls... but Kiddo absolutely hates them. 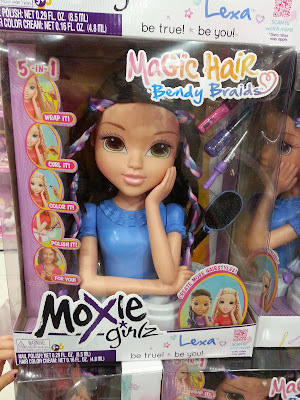 She always looks at me in exasperation each time I made her wait while I admire these dolls. To pull her leg, I'd say that I am getting her one of these dolls and you should see the look of horror on her face. Not all kids share similar taste as my kid, so I believe that there are lil' girls out there who will love these as much as myself. If the girl that you're shopping for is not much of a doll person, maybe this Hello Kitty Electronic Piano will make a good gift. Kiddo received this toy when she was 3 years old and a year later, she is still playing with it. 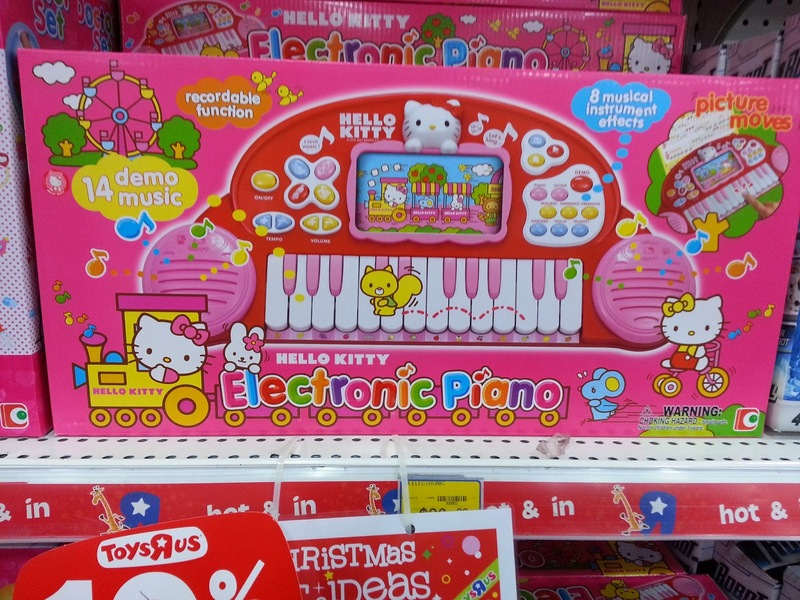 This electronic piano comes with many sheets of musical notes represented by different candies and fruit. The child has to press the candy/fruit labeled keys according to what is shown on the music sheets. There is also a recording function as well as several selection of instrument sounds. 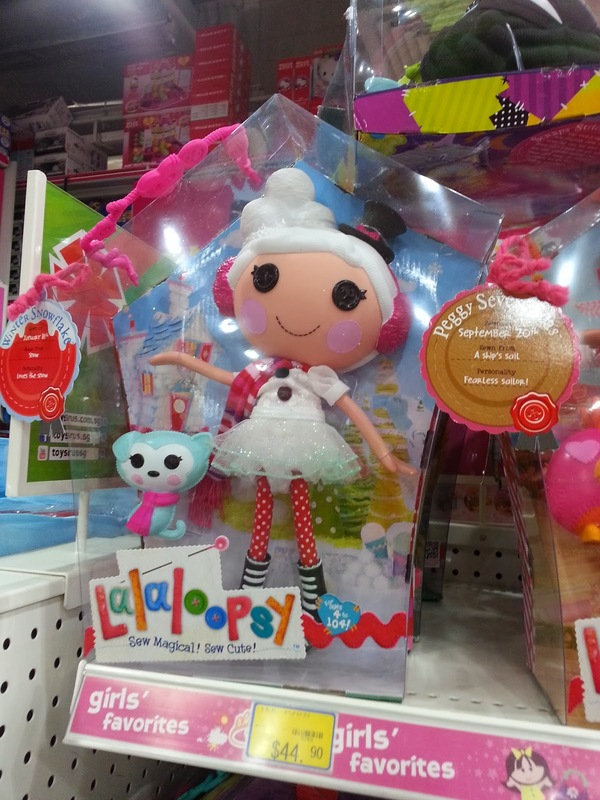 Enough of girl toys at the moment... here are some gifts that are suitable for both gender. 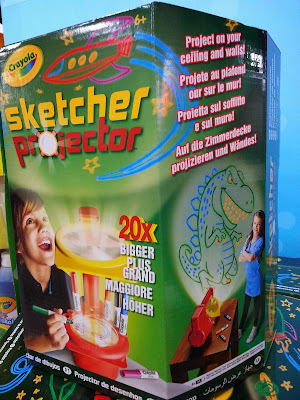 This Crayola Sketcher Projector looks like it would make a fab gift for a child who loves to draw. You'll be able to project whatever that is drawn on the transparent plates onto the ceiling or the wall. I've gotten this for a boy as a gift and he absolutely loves it. The projected images are not exactly sharp but it is still fun to work with. 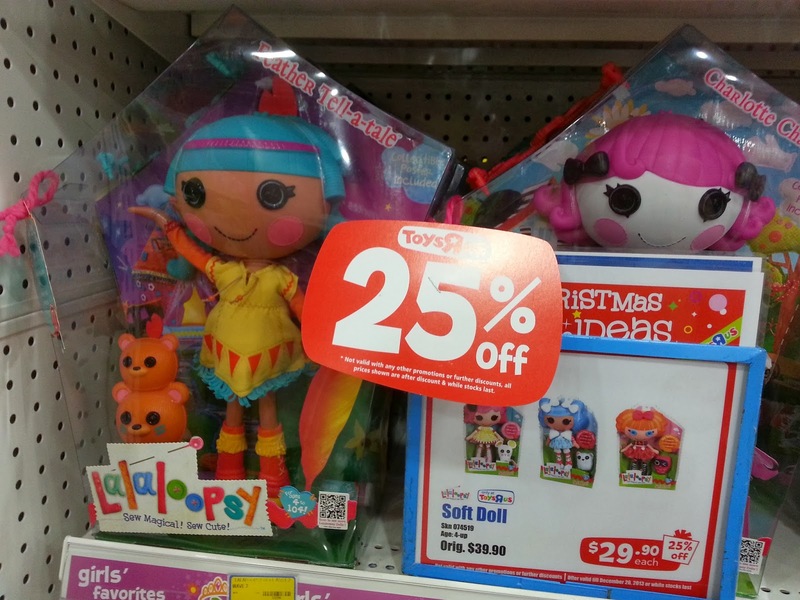 There is a 20% off for Crayola products right now and the price shown below is before discount. 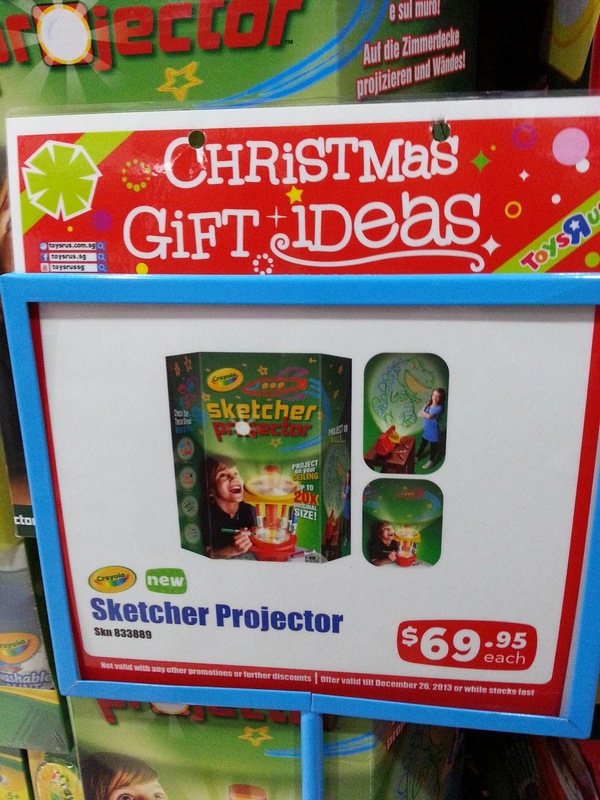 NOTE: MARKERS AND BATTERIES NOT INCLUDED. 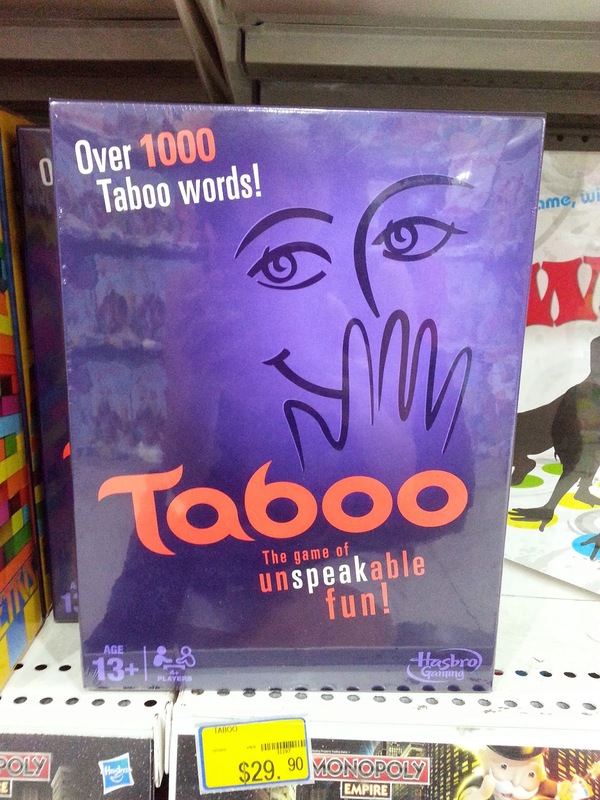 The last three items for this entry are games that the entire family can play together. I have the first edition of Pictureka and The Hubs and I love playing with it so much that we bought the app for our iPad. I've also bought this for a set of brothers and each time I visit them, they will never fail to get me to play this game with them. 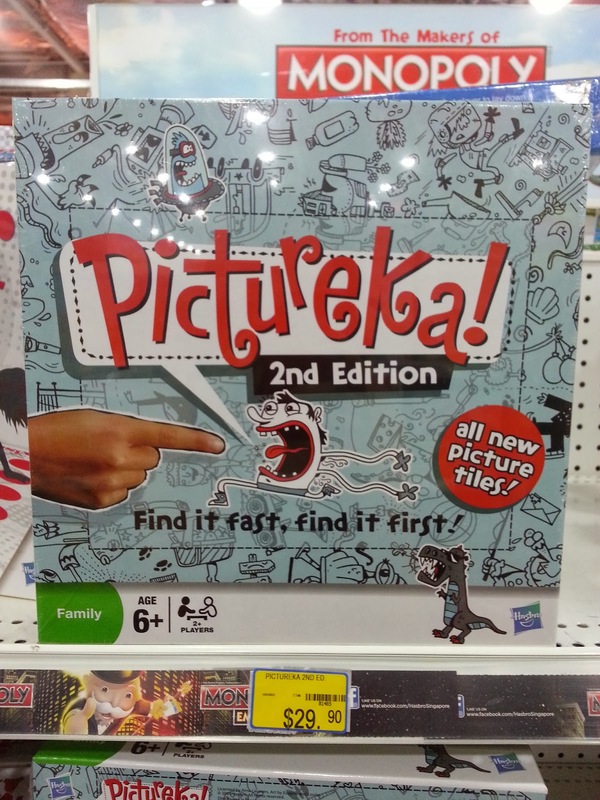 Pictureka is like 'Where's Wally' with a twist. It is a series of picture based puzzles. You draw a card and based on what is on the card, you have to look for e.g. 'things that light up', 'things that are cold' or 'three stars' etc. 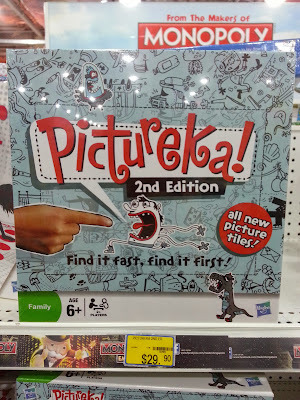 A fast paced board game for great family fun! 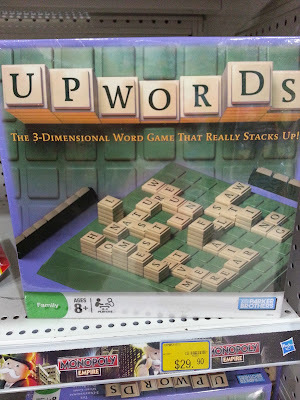 The Hubs and I were hooked on Upwards... oops, I meant UPWORDS for some time. 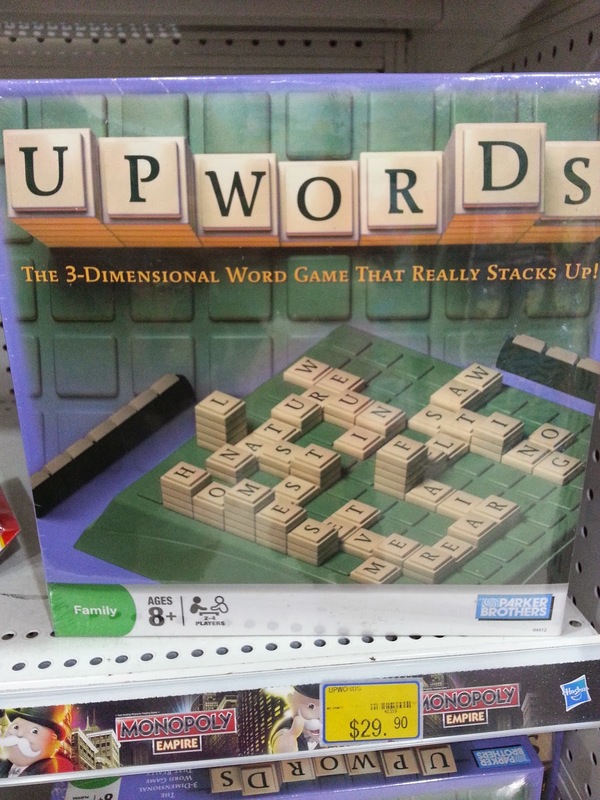 Unlike Scrabble, you're allowed to place letters adjacent to or on top of existing letters to make new words. Taboo is best played with at least 3 or more people and it's such a good ice-breaker or time filler when friends gather. 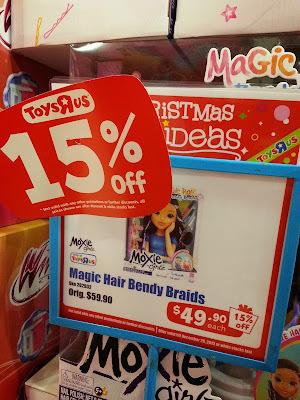 So can I 'chope' the Magic Hair Bendy Braids for Kiddo?